The breakdown of a ferry on the Seattle-Bremerton run could pose a problem for fans trying to get to Sunday’s Seahawks game. 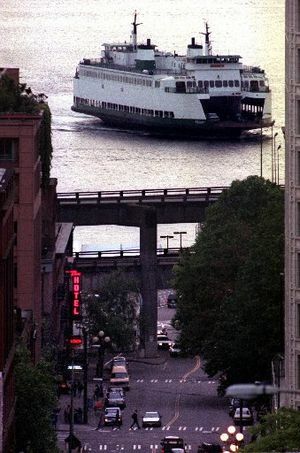 Washington State Ferries spokeswoman Susan Harris tells the Associated Press that while the Sealth is out of service, a smaller ferry with a capacity of about 700 people has been called in as a replacement. That ferry is scheduled to make the 9:45 run from Bremerton to Seattle tomorrow morning, and that’s the one people should try to avoid. Harris says Seahawks fans should take the 8:45 a.m. or 11:10 a.m. sailings from Bremerton instead, because those will be served by a bigger boat. The Seahawks play the Arizona Cardinals at 1:25 p.m.